Whenever he is damaged, Cao Chong can discard X cards. These cards' number's add up to the number of the card that damaged him. He can then choose up to X characters. These characters recover one unit of health. X cannot be greater than two. Cao Chong's discard phase is always skipped. 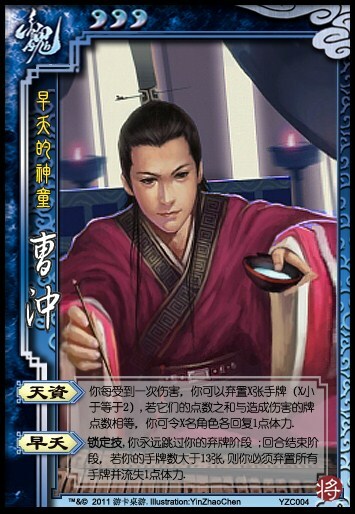 If Cao Chong ends his turn with more than 13 cards, he loses one health and discards all his hand cards. Cao Chong does not have to use "Talent", he can just take the damage. When he does use "Talent", the cards he discards must add up to the damaging card exactly. It cannot be more or less. When doing the math, A is 1, J is 11, Q is 12, and K is 13. "Early Death" is not a choice. Cao Chong must do as it says if it applies.